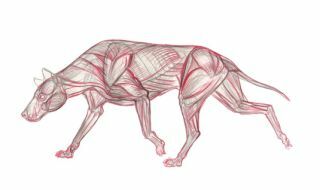 How complex muscle groups can be simplified to help build up an animal's form. When figuring out how to draw animals, an important step is to conduct muscle studies. Vertebrate anatomy is consistent and, as you study, you'll notice that muscle groups between different animals are very similar, if not the same. Just like with the skeletons, it's only the shapes and sizes that differ between different animals. Despite a few differences, vertebrate bodies all share the same basic muscle systems. In this article, I'll show you how to simplify these basic muscle groups to start building up an animal's form. For this example, I'll be drawing a canid (a dog) walking. We need a skeleton to attach our muscles to, so I begin with my 2H pencil and lay out a quick gesture. I'm not worried about detail; I just want the shape, proportion and motion at this stage. Wireframes are the easiest way to jot down an animal's pose. This technique is not only useful for foundation drawing like this, but also life drawing at the zoo. Using a harder lead for this will help keep the drawing light and workable as you move forward with your muscle study. Now that I've got my wireframe in place, I can introduce a few details. These are what I call landmark bones, such as the scapula, the ribs and the great trochanter. These are bones where muscle groups attach. I keep my touch light here still. I'm only looking for landmarks that'll help inform where my muscles need to attach to the skeleton. You'll notice that my canid skeleton isn't detailed, but the gesture and proportions are in place so that I can build on top of it. This is probably the most valuable and important step. We know that there are complicated muscle systems in place, but we really just want to find the major shape so we can begin to see the whole shape of the animal. Using an HB pencil, I lay in those large groups over my skeleton. When I draw muscle groups, I'm only thinking about large shapes that house lots of different, smaller muscle shapes. This keeps things simple and helps you see the entire shape of the animal. Now that I've got my basic shape, I find those muscle systems around the body. This is where textbooks and diagrams will inform you. Remember that muscles pull from bone. They're directly attached, and push and pull the skeleton around. I begin to find those smaller muscle systems inside of the larger muscle groups. I'm always looking to see where the muscle is attached to the bone. At this point I switch to my red Col-Erase pencil. These pencils are great because you can easily range from dark to light. However, they do wear down quickly, so if you're drawing from life, it's a good idea to have a few ready to go with sharpened tips, just so you can switch them out quickly and not waste time sharpening. It's time to find those muscle details. I show the different ligaments and texture of the muscle, which help indicate the direction in which things move around. I'm careful to keep my pencil loose so as not to lose that 'flow' as I draw. I begin to find those smaller muscle systems inside of the larger muscle groups. I'm always looking to see where the muscle is attached to the bone. Adding detail such as texture and value can help make your study more readable. The advantage of using different colours in pencil is that you can always reference both the skeleton and the muscles, to see where they’re attached. This article was originally published in ImagineFX, the world's best-selling magazine for digital artists. Subscribe now.